At least one faction within Umno has dubbed Najib Razak's deputy in party and government Muhyiddin Yassin a pengkianat (traitor) for his statement on the PM's 1MDB and the Home Minister's 3-month ban on The Edge last night. I thought that was excessive. I'm more inclined to agree with the guys at the Unspinners, who are pro but not rabidly pro-Najib, who contend that Jika TSMY membodek, usaha meyakinkan rakyat take maenad ... In a nutshell, there is another faction within Umno who believes that Muhyiddin had to play the Devil's advocate in order to keep the people's faith in the party and in Najib. Personally, I would go as far as to say that Abang Din is the last Umno man you'd call a pengkhianat. If he hadn't stood up when everyone else would not dare to even look up back then, Pak Lah would not have stepped down in 2009 and Najib would not have become Prime Minister and Tun Mahathir might not have succeeded in toppling his successor. 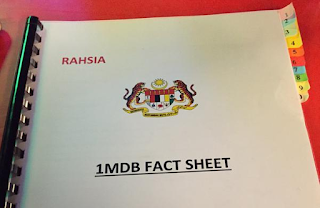 All the same, it's hard not to find his depedence on the Edge for information on 1MDB a little mind-boggling. He could have asked Abdul Wahid Omar or Rahman Dahlan to help him understand the 1MDB issue if he's not confident that Husni, the MOF 2, is qualified enough There's also the Fact Sheet on 1MDB that was given to every Minister to help them understand what the 1MDB issue is all about. Of course (it could be for real). Muhyiddin's back may be against the wall. Zahid Hamidi (Zahid lebih berani dari Muhyiddin) has emerged as a strong contender for No 2 and the 3-month suspension of the Edge is a move that will win Zahid big support in Umno, (Muhyiddin's) own Education portfolio is giving him nightmares, his son and son-in-law's business ventures are the subject of cruel gossips in the corridors of PWTC, and Tun M's pressure on him to act is piling up! Dear Reader: Wow, that's lengthy! Bru: The short answer is - Pening! Bru: What is YOUR take on Muhyiddin's speech? Wait, watch this clipping first. There are nuances here that are not in the TMI article. Dear Reader: This clipping from last nite or the previous talk? Dear Reader: Okay, I'll listen to it. Dear Reader: Sebagai seorang rakyat marhaen, saya rasa dia melawan boss dia (As an ordinary citizen, I feel that he is going against his boss). At this point, I had to say goodbye to Dear Reader to keep my 11am appointment with the MRI: a 20-minute claustrophobic session inside a freezing, futuristic capsule that felt like a coffin and forever. I imagined I was on the beach (which didn't work) and then imagined I was attending a rock concert with my eyes closed. The banging and clanging was not so bad after a while and I think I know now what which might have inspired Pink Floyd's best. As I'm writing this, I received a final text from the reader. Dear Reader: I have listened (to Muhyiddin's clipping). And I do agree w what he said. Does the Malaysian mainstream media give accurate, factual and unbiased information about 1MDB and related matters? How many Ministers and VIPs read, for instance, the Singapore papers such as The Straits Times and Business Times for their coverage of Malaysian news? Or tune into Channel NewsAsia TV broadcasts? What is wrong with reading The Edge? Or the Wall Street Journal, the Financial Times or The Economist? With a multiplicity of news sources, we should be able to read, watch and understand different points of view or different takes on the same subject. "his son and son-in-law's business ventures are the subject of cruel gossips in the corridors of PWTC"
Would Azmi say the DPM was talking like a zapper yesterday? Which son or whatever sons,cousins,anak branak,family,brothers is more gossips of them all. No to worry about tsmy, you boss is about to terminate him already. The treacherous sob. Now najib will have more front to fight against and more money for bloggers like you to fight his war :$:). I think DPM is just giving his honest opinion. He has voiced concerns on the past on the effect of 1MDB and since then the PR by PMO and 1MDB themselves has been a disaster. By banning the Edge you only make the public think the government has more to hide. And what about Nazir Razak - he has been even more vocal - will the PM disown him as a brother? So far Muhyiddin has been playing it fairly straight - not showing ambition for the job; handling issues when the PM has been away on his many foreign visits. He can see UMNO is in trouble and has to voice his concerns. Well bro , it looks like TSMY is preparing himself to take over the lucrative and powerful PM post . His outburst is a simple way of saying i'm ready . After all , he is already previliged to a lot of info and secret . But then by saying it loudly in public after having access to thos info , it goes to show TSMY is attempting to sever tie with the PM . Now this is a no no . That is Hang Jebat . A repeat of Hang Jebat story ? itu ringgit sudah jatuh, worst in 17 years, boleh tak pecat itu menteri kewangan? Your buddy has done the deed. this is politics but then Zahid Hamidi???? Can he communicate in English? I shudder about this... How can this an to our great country. Your thoughts on English being an important asset to communicate in a global environment? Come on sir.. Dying to know your reaction and comment regarding your beloved bugis warrior PM. Still with him after all this ridiculous, clueless and delusional actions. The AG ghani who Is in the task force to investigate 1imdb, muhyiddin who is once in a while slamming najib in his gov (the only one in the cabinet who has the gut to do so) were fired today. But then the ugly and shocking news is 4 members of PAC get promoted to be minister/ dep minister. Salleh keruak who is also najib's loyal fan also get to be a minister. The trend is, if you want to be and stay still as minister in najib's cabinet mesti mau sokong najib dan 1imdb. Wth and WTF is that. i guess ur devil's advocate theory now is proven wrong. its just wht it is. now if ur take on the dpm still holds, tht means the scumbag now is who? We should just look at his performance in his education portfolio. He is lousy as Education Minister with our universities rangking >150th in the world. We dont need 1MDB to tell us TSM should be dropped from kabinet. Yep, let's look at the high standards of homeland security. ....ummmmmmm, who missed their KPIs, again? Rocky, er… encik boleh bagi comment sikit about that leaked video conversation between Muhyiddin, Mukriz and Kadir Sheikh Fadzir. Now decide. Pengkhianat or hero? "BUKAN mcm. PUAKA-PUAKA PENIPU dari puak PENDATANG TERORIS-TERORIS KAPIRDAJAL DAPBANGKAI/PKRHOMO-EJEN Barat/ZIONIS-PEROMPAK/PENJENAYAH- no 1, yg. begitu galak tak habis-habis nak MENJATUHkan ISLAM; NEGARA ISLAM pusaka nenek moyang berzaman kita ini; DYMM Kesultanan Islam/Melayu kita sbg. PENJAGA Islam dan kaum Bumiputera, HAK dan IDENTITI Bumiputera Islam/Melayu kita, IMDB/MARA/UMNO dll., YAB PM Islam/Melayu, DS Mohd. Najib Tun Razak kita serta isteri, DS Rosmah Mansor; dan LEGASI-amat-GEMILANG Ayahanda YAB PM, iaitu BAPA KEMERDEKAAN/BAPA PEMBANGUNAN BUMIPUTERA-no-1, Allahyarham YAB PM Tun Abdul Razak Hussein TERCINTA kita!!!!!!!!!!!!!!!!!!!!!!"